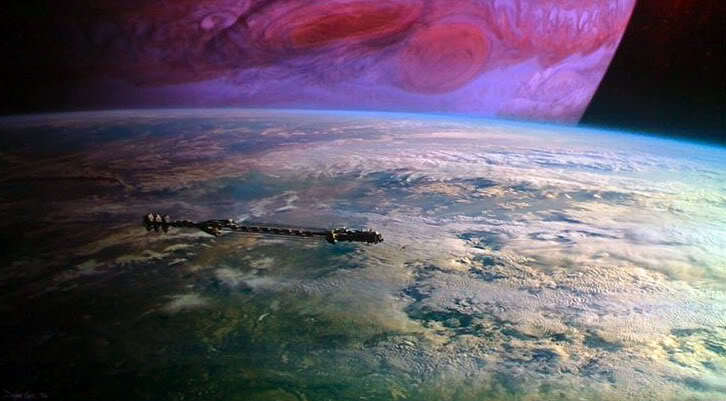 The inhabited moon Pandora in the film Avatar in orbit around a Jupiter-like planet. With biological or prebiotic chemical interest surrounding Europa, Callisto, Titan, and Triton, scientists are increasingly becoming interested in the possibility that large satellites, in addition to planets, might support conditions suitable for life.1, 2 A number of giant worlds have been discovered circling relatively nearby Sun-like stars (see extrasolar planets) and, although these seem to offer poor prospects for terrestrial-type biologies, it has been suggested that large moons in orbit around some of these newly-found planets might fall into the habitable zone where can life can arise. 1. Chyba, C. "Exobiology: Life on Other Moons," Nature, 385, 201 (1997). 2. Williams, D. M., Kasting, T. F., and Wade, B. H. "Habitable Moons Around Extrasolar Giant Planets," Nature, 385, 234 (1997).